14. "Roundabout": median and highway, Nofei Prat, West Bank. 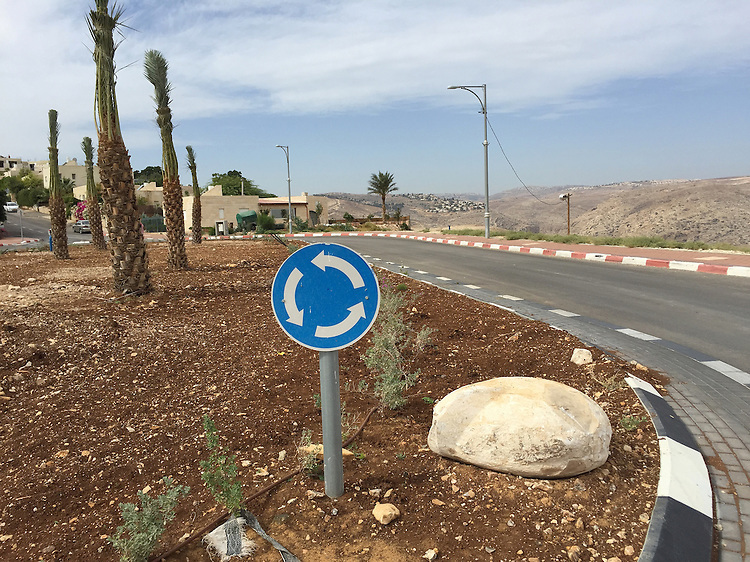 The bright blue "roundabout" sign seems like a metaphor for the ongoing land disputes in the West Bank. Many settlers use the biblical terms, "Judea and Samaria," to refer to the area in place of "West Bank." Does this help justify their presence and their actions? On the left one can see the settlers' homes; on the right the Judean Desert hills and another settlement in the distance. And in the middle, the blue sign and a heavy rock are firmly planted, as if to say, "We're not going anywhere!"